The Erie Railroad built 100 of this class of welded steel cupola cabooses at their shops in Dunmore, Pa., in 1945 and 1946. The class was numbered C170 to C269 and was the last class of cupola cabooses built by the Erie. After the construction of the C269, the Erie’s Dunmore shops built one more caboose, C300, a prototype bay window caboose which became the model for 50 cars ordered from International Car Company. The C254 was built in 1946 and its current paint scheme resembles the paint scheme it would have worn out of the Dunmore shops. 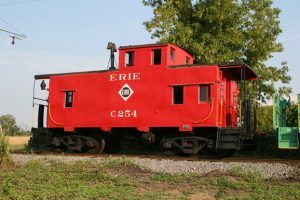 Within this class of Erie caboose, there were two subclasses which differed in many dimensions. The C254 was part of the later group ranging in numbers from C222 to C269. The caboose rides on modified freight car trucks. These cabooses were of a welded steel design and are easily differentiated from the earlier series, C100-C169, which were riveted together. Many of these cabooses survived through the Erie Lackawanna merger of 1960 and into the Conrail takeover in 1976. In later years, many being sold off to private individuals, museums, and historical societies. Other such cabooses preserved include the Jersey Central Chapter’s #C177 (Whippany, N.J.) and Western New York Railroad Historical Society’s #C216 (Hamburg, N.Y.). Caboose No. C254 was donated by Conrail to the museum, and delivered to Industry by rail. An exhaustive restoration took place between 1992 and 1994. All new windows and window frames have been fabricated and installed. In the future, it is also hoped to restore the roof walks, loop ladders, and grab irons cut off under Conrail ownership. This caboose is in regular operation, which you can ride on your next visit to our museum. Built in 1946 at Erie shops in Dunmore, Pa.